Wed., 6 Nov. - Fri., 15 Nov. Sat., 12 Oct. - Wed., 20 Nov. Sat., 7 Sep. - Mon., 7 Oct. Sat., 12 Oct. - Thu., 14 Nov. Mon., 9 Dec. - Fri., 20 Dec. Thu., 17 Oct. - Mon., 28 Oct.
Fri., 29 Nov. - Tue., 10 Dec. Mon., 2 Sep. - Tue., 24 Sep.
Wed., 30 Oct. - Wed., 5 Feb.
Wed., 8 May - Tue., 11 Jun. Mon., 7 Oct. - Thu., 14 Nov. Tue., 8 Oct. - Sun., 17 Nov. Mon., 25 Nov. - Tue., 3 Dec. Thu., 12 Sep. - Thu., 3 Oct. Sat., 23 Nov. - Thu., 5 Dec. Sat., 1 Jun. - Sun., 16 Jun. Thu., 13 Jun. - Sun., 23 Jun. 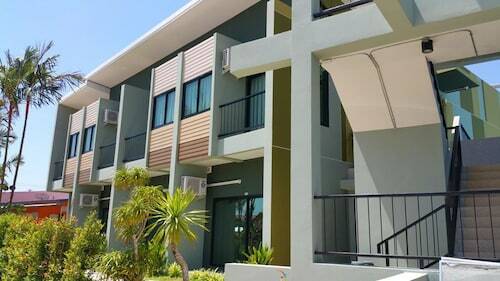 Fri., 13 Dec. - Tue., 31 Dec.
Nestled on the beach, this Mai Khao resort is 0.1 mi (0.1 km) from Splash Jungle Water Park and 1.5 mi (2.4 km) from Mai Khao Beach. Nai Yang Beach and Yacht Haven Marina are also within 9 mi (15 km). Situated near the beach, this hotel is within a 10-minute walk of Mai Khao Beach and Nai Yang Beach. Sirinat National Park is 0.8 mi (1.3 km) away. 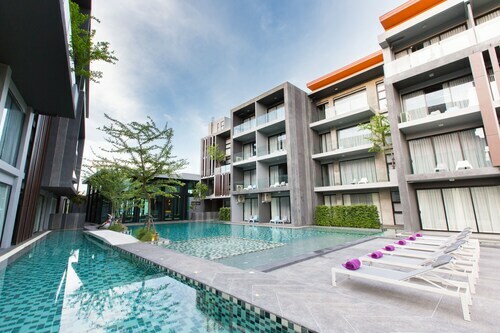 Situated near the airport, this hotel is within a 15-minute walk of Mai Khao Beach and Nai Yang Beach. Sirinat National Park is 1 mi (1.7 km) away. 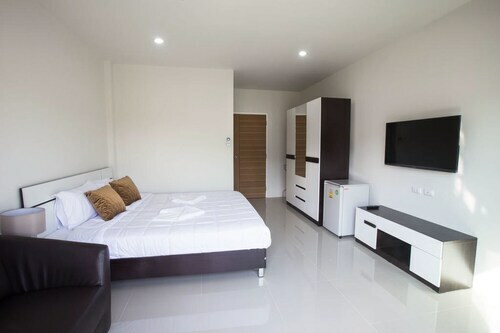 Situated in Sa Khu, this hotel is within 2 mi (3 km) of Mai Khao Beach, Nai Yang Beach, and Sirinat National Park. Nai Thon Beach and Blue Canyon Country Club are also within 6 mi (10 km). 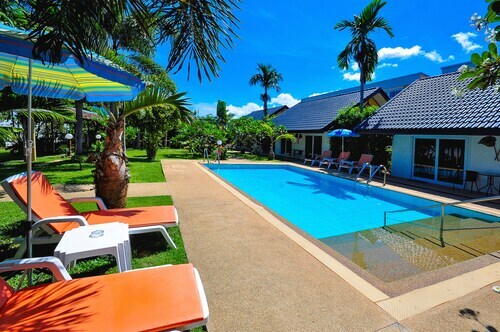 Situated in Mai Khao, this hotel is within 2 mi (3 km) of Mai Khao Beach, Nai Yang Beach, and Sirinat National Park. Blue Canyon Country Club is 2.5 mi (4.1 km) away. 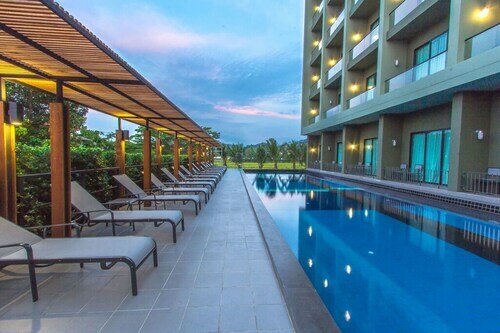 Situated in Sa Khu, this hotel is within 2 mi (3 km) of Mai Khao Beach, Nai Yang Beach, and Sirinat National Park. Nai Thon Beach and Splash Jungle Water Park are also within 6 mi (10 km). 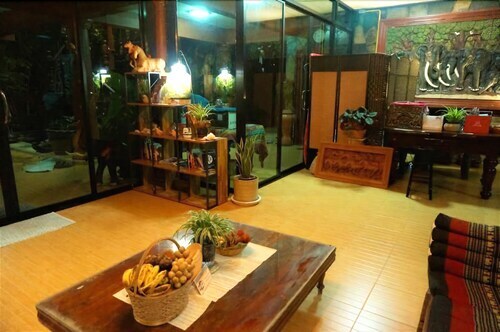 Situated in Mai Khao, this hotel is 1.4 mi (2.3 km) from Nai Yang Beach and 1.7 mi (2.8 km) from Sirinat National Park. Blue Canyon Country Club is 3.1 mi (5 km) away. Answer : Yes, you can switch your departure or arrival date. If you wish to save a little cash in doing so, the lowest-cost day to fly in May is Monday. Having flexibility in your travel plans means you can save more, so be sure to plan ahead when possible. Question : How much time do people spend in Phuket? Answer : The average time spent in Phuket by passengers from Toronto is 15 days. However long you decide to stay, give yourself plenty of time to see what makes Phuket fantastic. Question : How much is a plane ticket to Phuket (HKT) from Toronto (YYZ)? Answer : Prices range anywhere from $809 to $10,617. Booking far in advance can typically help you get the cheapest ticket. Don't forget, the sooner you book, the better price you tend to get. Question : What is the cheapest date to fly to Phuket? Answer : May 20th has bookings (as of Apr 22nd) as cheap as $809. That comes in 59% below the average price. Saving on flight costs means you'll have more moolah in your pocket. Answer : The cheapest day to fly from Toronto to Phuket is on Monday. If you want to save some money on your next business trip look for flights on Monday. Question : What is the cheapest airline flying from Toronto to Phuket? Answer : China Eastern Airlines is your best flying friend for finding that coveted low fare. They offer fares as low as $809, while prices for other flights can cost as much as $10,617.